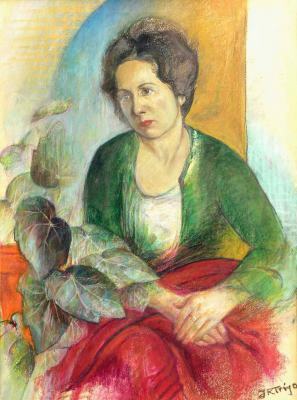 Forms that suggest the third dimension of volume, rich with nuances of colour (note especially the head and hands), are here made compatible with surfaces of flat colour (with no relief effect); in the same way, linear contours and blurred outlines (seemingly antagonistic devices) concur in this portrait. All of these elements help to create a mood of lyricism and nostalgia, condensed in the subject's gaze and the warmth of her hands. It is perhaps a maternal nostalgia, for an absent loved one. 1 Note: It may be said that any work of art has something of the epic (objective description), the lyrical (reflecting the subjectivity of the artist) and the dramatic (without a certain degree of dramatic tension, a work of art would be incapable of attracting the viewer’s attention, in the same way that a sporting event lacking in such tension would hold little interest for the spectator).